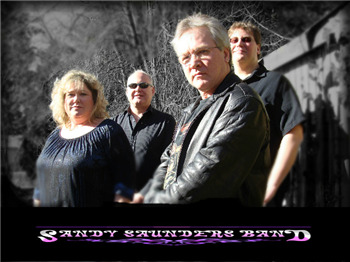 Share Sandy Saunders Band's EPK! As a representative of the Relay For Life in Oregon City, I would like to send a huge thank you out to all of the members of the Sandy Saunders Band. Your performance was not only appreciated, it was ENJOYED!!!! Your band was on the feedback forms a "favorite" moment of Relay. And of the "things to repeat", your band was top in that category! As a venue owner that hosts 150+ acts per season, it is a pleasure to work with the professionals that make up the Sandy Saunders Band. Clear and diligent communication in advance. On time for set up. Performed as agreed. Nice mix of popular covers and originals. Good connection with audience. Performed beyond expectations. Courteous throughout. Hope to have them again. - Der Hinterhof, Leavenworth Wa. In 2008 Sandy, with the help of Bob Love, Chris Miller(Dave Alvin, Lucinda Williams), Greg Jackson(Jackson Road), Stevie Marie and Kevin Eddinger recorded an EP, " A TASTE OF SANDY SAUNDERS." Although "A Taste" was just a sample of Sandy's music in true country form, it introduced many folks to her great original music like "Shoot Myself", "Honey-dew" and "White Sand & Margaritas". 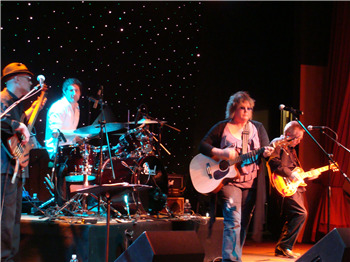 In 2011 Sandy and Billy Lindsay recorded "Who need's 'em" a semi-acoustic mix of originals plus one cover. The Sandy Saunders Band is currently working in the studio on a full length all original L.P. due to be released in 2012. It's no surprise that this group is considered as one of the top bands to come out of the Northwest in recent years. The Sandy Saunders Band, lead by Augusta, Georgia native, Sandy Saunders, is a group of truly world class musicians. Upfront, Sandy is known as a person who pours her heart and soul into every performance and every recording. Sandy is not only a powerful vocalist and guitarist, but a first class entertainer that will bring crowd to its feet and keep them there throughout the show. Sandy's own brand of country-rock & classic-rock stems from such influences as, Susan Tedeschi, Lucinda Williams, and Janis Joplin, to rock artists like Led Zeppelin and The Rolling Stones. The Sandy Saunders Band's rhythm section is made up of Scott Cwalinski on drums and Jeff Woodcock on bass. Scott joined the group after making a name for himself as one of the top drummers on the Las Vegas strip, where he spent 14 years playing alongside countless headliners such as Joe Walsh and Pat Benatar, just to name a couple. Bassist / vocalist, Jeff Woodcock, is also known as a top pick bass player in the Northwest on stage as well as in the studio. Jeff's vocals are a perfect complement to rest of the band. The Sandy Saunders Band set list is extensive and contains everything from Country songs from artists like Sugarland and Kelly Willis, to rock hits from Janis Joplin, Jimi Hendrix, Led Zeppelin, to tunes by Susan Tedeschi and Bonnie Raitt in addition to Sandy Saunders Band originals. Here is a sample of what we play.